Both the federal and many state governments in the United States, including New Jersey, assess an estate tax upon transfer of a deceased person’s assets. Thus, while it is often begrudgingly referred to as a “death tax,” it is actually a type of transfer tax which is imposed upon the transfer of the property in the taxable estate of every decedent (the deceased) who was a citizen or resident of the United States. The “taxable estate” can be calculated by subtracting permitted deductions from the gross estate. The “gross estate” includes the value of all property that the decedent had an interest in at the time of her death. The gross estate may also include any interest in the estate as dower or curtesy (an amount promised by one spouse to another in the event of death), items that the decedent transferred in the three years prior to death which were not sold for value or excluded as gifts, certain property that the decedent transferred but retained a life estate in, the value of property in which the decedent had a reversionary interest in excess of five percent of the property value, annuities, some jointly owned property, powers of appointment, and some life insurance policies, among other things. 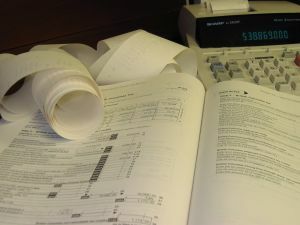 Some common deductions from the gross estate, which are used to calculate the total “taxable estate,” may include funeral expenses, estate administration expenses, claims against the estate, some unpaid mortgages, certain charitable contributions, property or bequests left to the surviving spouse, interest in a qualified family-owned business, and state estate or inheritance taxes. However, there is an exemption also known as a unified credit, where, if the taxable estate’s total value is less than a certain number set by the IRS, then no federal estate tax must be paid. For 2014, that amount was $5,340,000. Therefore, if the taxable estate of a decedent who passed away in 2014 was $5,340,000 or less, no federal estate tax is owed and no return need be filed. In New Jersey, an estate must file a tax return if the decedent’s gross estate plus adjusted taxable gifts exceeds $675,000. That return generally must be filed within nine months of death, and the filer must provide the state with a copy of the federal estate tax return within 30 days of its filing with the IRS. Any New Jersey estate tax which is not paid within nine months of the decedent’s date of death will typically accrue interest at 10 percent. New Jersey’s estate tax generally matches the federal estate tax rules. For instance, any election made by a taxpayer for federal estate tax must also be made in the state return. Civil union partners, however, would complete the state tax forms as though the IRS treated them the same as surviving spouses. If a federal estate tax return is not required and is not filed, the taxpayer may submit the tax return using an alternative “Simplified Tax System” method. This System requires that a Form IT-Estate be filed along with a New Jersey inheritance tax return (Form IT-R). In New Jersey, the estate tax becomes a lien on all the decedent’s property, which then cannot be transferred or distributed until a tax waiver form or release is received from the New Jersey Division of Taxation. In New Jersey, the proceeds of an estate may also be subject to inheritance taxes , depending on the beneficiaries’ relationship to the decedent. For instance, parents, grandparents, spouses, children, and grandchildren are all exempt from the inheritance tax. Thus, if the beneficiaries of a decedent include only people in this category of beneficiaries (referred to as “Class A beneficiaries”), then, generally, no inheritance taxes will be assessed. However, siblings, sons or daughters-in law, aunts, uncles, cousins, or other named beneficiaries (other than qualifying charities) all may incur an inheritance tax. McLaughlin & Nardi, LLC’s tax attorneys are experienced with Federal and New Jersey state estate and inheritance tax laws, as well as estate planning, estate administration, and estate litigation. To learn more about what we may be able to do to help, please visit our website or contact one of our New Jersey lawyers by e-mail or telephone at (973) 890-0004.